When I first started meditating, I did it, because it sounded like a good way to learn more about myself. Who am I, I asked in my journal over and over again. They said, meditation is a good way to get to know yourself. For whatever reason, I have always been interested in learning and knowing more about myself. The physical world is awesome, and I like living in it. But I spend a lot of time in myself, in my head, and in my body, trying to figure out who am I and all of those fun questions. In addition, I only feel attracted to people who are on the same journey as I am. The people who ask the difficult questions, and who sit alone with themselves while they ponder these intriguing questions. Who am I? Why am I here? What is going on in this world? Why does it feel like everything is going to hell in a hand-basket? How can I be the best person possible in every moment? Why do I feel like such a failure at times? What can I do to leave this world a better place than when I came into it? Am I doing the best I can in every moment? Where will we go from here? Will it resemble Earth in any form? Do past lives exist? If they do exist, is time non-linear and are all past lives happening all at once? Do parallel universes exist? Do ghosts, fairies, and unicorns exist? Why do I believe that this world is magical and everyone is good? So in this question-filled life, I found that I was getting no answers from talking to others. I found some answers by reading books, and doing yoga. But I wanted more. I was tired of getting answers from the outside. I wanted my own answers. I wanted to get my answers from deep within me, from that deep wellspring of wisdom that I know exists inside of me. I know it’s there. I just had to find it. Silence and meditation seemed to be the only path to that wellspring, from what I saw in the books, and scriptures. Silence. I was scared of the silence at first. Even in my dreams, there is a recurring theme. I see blackness everywhere. I go down to basements where there is darkness. The dark crevices of my mind are filled with black slimy beings that overwhelm me with fear as I come running back to the light and to consciousness. This recurring dream proved to me that there is something dark within me. I’m blackness within. Not an angel of goodness, but something evil. Silence meant confronting that evil. I wasn’t ready to do that. I felt afraid. But of course, what we resist is what we need to do. Our resistance shows us exactly what our next steps should be. I knew I had to meditate. I still remember my first attempt at meditating. I was afraid to meditate at home or in front of people. I thought I would be ridiculed. Meditation wasn’t really accepted in January 2012 as it is right now. I think I meditated before January 2012 as well, but it wasn’t as solid and as well-intentioned as when I began in January 2012. I had just come back from Thailand, one of my first trips to Koh Phangan, the magical island that I love from the bottom of my heart. I had been cheated on and had my heart broken. I decided January 2012 would be a different year. I would start it off completely different. I had finished my Yoga Teacher Training (YTT) the previous year in December of 2011. All of a sudden, I had this sense of wanting to sit in meditation on my own as I had done several guided practices with the teachers at my YTT. I would get to my workplace at Don Mills and Eglinton in Toronto, half an hour before I was supposed to start work at 830am. I would switch off the car, sit cross-legged, pop-in some didgeridoo music (put me into this awesome trance state), close my eyes, and meld with the music. I parked in the far off corner of the parking lot, so no one would be able to see me, sitting in my car, with my eyes closed. I was afraid they would make fun of me. I made fun of myself (more on that later). I did this consistently for 3 months in which I met Theo (my best relationship till date), started teaching yoga 4-6 times a week, got extremely fit, started hanging out with a great bunch of new friends, fell in love, and started earning really good money from my job through commissions. Did Meditation Cause The Changes? At first, I wondered how I was becoming so lucky. I mean, all the changes I outlined in the paragraph above were outer changes. But they happened because I changed on the inside. I began taking more responsibility for myself. I started working on making my dream of becoming a full-time yoga teacher happen. I started loving myself more, so I was able to receive love from Theo and the other friends that popped up. I began seeing myself so much clearer. I started noticing the patterns in my life. I started improving my relationship with my parents. I started telling more truths to myself and others. I realized very soon that meditation was causing the changes in my life. As my inner landscape changed, my outer world started transforming very rapidly. The number of changes that occurred in those 3 or 4 months of meditating were equal to the number of changes that occurred in the last few years of my life. That is one thing I want to highlight about meditation. It changes time by compressing certain parts and expanding others. Every single moment extends into eternity, but decades go by in a flash. Meditation causes me to be so much more aware of every single moment. I am hyperaware of everything around me and inside of me. Meditation also causes changes to happen so rapidly that life changes in a flash. Changes a non-meditator might make in a decade, will happen to a meditator in a few months. After the first 3 months in the car, I decided to meditate at home on a comfortable couch every morning. That is what I did for the next few months. My income expanded. I was closer than ever to paying off my student loans ($35,000 paid off in 1 year). I was in love with a man who adored and treasured me. I had a huge group of friends that I hadn’t had in years. I was teaching yoga and living a spiritual life based on my truths for the first time ever. I realized Theo wanted to travel long-term and we started making plans to drive down to Ushuaia from Toronto. I was in ecstasy. At this point, as most of us do, I stopped meditating. It was busy. I was in love. I didn’t need it anymore, I believed. It had given me all that it could (HA!). Whatever the reasons I told myself, false they were. Even so, I stopped meditating. When I should have kept up my practice most, I stopped. The changes as they do didn’t happen right away (that’s why I didn’t associate them with the lack of a meditation practice). My relationship with Theo started failing. We were fighting a lot more. My friendships started falling off due to lack of care and attention. I started disliking myself again and had a hard time receiving love. I lost interest in teaching yoga. I became obsessed with the trip believing it would be my salvation. I started fighting with my parents even more so. I lost my connection with my sister and brother. I felt alone and lost. As it happens, I had fallen behind. Much further behind than I had been when I started meditating. We came back from the drive down to Panama City, our trip cut short from exhaustion, and a job offer. I had started meditating intermittently at the end of the trip, but I really got into it, once I got back to Toronto and had a stable bedroom to work from. That little bedroom in my parent’s home became my salvation. I meditated. I realized some essential truths. Theo and I were going to break up. I was unhappy in my job with my crazy boss. I had to start acting like an adult. My relationship ended. I was fired from my job. My love for travel felt tainted. Every identity I had dissolved away in the tears that I cried daily. A phoenix rises from the ashes. So did I.
I created a vision board for what I wanted my life to look like. Within 2 months of putting a condo downtown Toronto on my board, I received a call about a condo my parents and I had bought 5 years ago that was finally complete. Move-in date? January 2015. I finally had a space of my own. I decorated it with quotes, and manifestos. It was simply dressed, but it was my space. I blossomed in that space. I am forever grateful for that call that completely changed the game for me. In that apartment, I started my morning rituals that I have kept going almost till now. Journaling. Meditating. Affirmations. Making my bed everyday. Reading positive books. Eliminating TV. Regular yoga. Eating healthy (slowly moving to vegetarianism). Financial stability. With all of those rituals, I started building myself up again. I found a great job. I started meeting awesome people again. I met amazing men who came into my life briefly but left a major impact. I started exploring my sexuality and loving the journey. As soon as I start a regular, consistent morning meditation practice, my life starts changing in random, rapid, and awe-inspiring ways. My life starts resembling more and more the ideal that I have placed so delicately in the pictures in my head. As soon as I stop meditating, my life seems to tumble around me in waste and decrepitness. Could it be mere coincidence? I don’t think so. I really don’t think so. Which brings up the question – Why do I freaking stop meditating then? Valid question. I think the ego comes into for me. I start believing that the changes in my life are happening just because of me, not because of some random age-old practice of sitting in silence (I mean, seriously, what could that possibly do?). My ego inflates as my life expands. I start thinking I’m too cool for school and at this point, the meditation practice just seems superfluous to me. I have done that enough times now to realize what a huge mistake it is. My past experience has proved that meditation is the only thing I need to keep doing until the end of time. I have been meditating consistently for the past year (with no breaks). Not coincidentally, this year has been the most magnanimous, and fantastic year for me. It has been filled with so much joy, abundance, friendship, love, and gratitude that I almost can’t believe it’s only a year. So much has happened. I quit my job to start my own business. I met so many amazing men who taught me so much about myself. I made some truly long-lasting friendships. I started a business based on meditation and mindset (me!). I’m moving to Chiang Mai. My relationships with my siblings, and parents is stronger than ever. My relationship with myself gets better and better every single day. My physical body is stronger than ever before. I meet new people who become fast friends all over the place, on park benches, music festivals, and grocery lineups. I know there are so many more changes coming and I’m so excited to be alive in every single moment. I have attached an audio to this post to showcase exactly how much joy I feel on a daily basis (recorded on Sep 12th after an amazing Yin Yoga class). What Does My Practice Look Like Now? My practice has been getting simpler and simpler over the past few months. I want to create a practice that I can do anywhere. Even when I travelled to far-off places for music festivals in the summer, I managed to sit down for a few minutes every morning in silence or with music. It was short, and sweet, but it was there. That’s what I want people to realize. 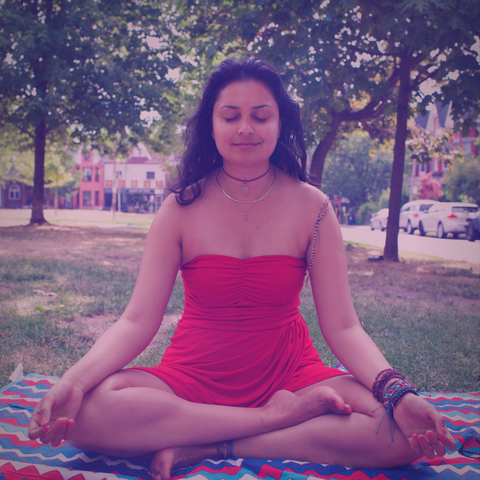 A meditation practice is unique to the individual practicing. It is also messy. We aren’t perfect beings, and thus, our meditation practice will be imperfect. Somedays, I wake up and I want to die at the thought of being in silence for even five minutes. Some other days, I sit for an hour and it feels like five minutes. My meditation practice consists of waking up (without an alarm), going to pee if necessary, getting under the covers on the couch or the bed, closing my eyes, and sitting. Sometimes I play music if I need it. Other times I use binaural beats (my favourite is this one). Some other times I sit in silence, listening to the birds chirping, or the white noise around me. Maybe sometimes I go deep within me. Sometimes I stay on the surface. Every single day is different. My meditation practice evolves and changes as time goes on. It is as simple as possible. As soon as the time I want to sit for ends, I open my eyes. The world in those few moments after a meditation practice looks so different. Fresh. Inviting. Loving. Bright. I always try to savour those moments. They are precious to me. They show me that I’m changing from the inside out. Will I Ever Stop Meditating? I couldn’t stop even if I tried. Those days when I wake up and realize I’m late, I rush off to my meetings without a practice. Eventually, I have to stop and do a practice mid-day or at least before I go to sleep. I HAVE to practice at least once a day everyday. Even if it is a five minute mini-practice, I have to sit down every single day with myself. Those days that I do a mini-practice, I miss myself, the silence and sitting by myself in a dark room, watching myself. I always end up doing a longer session the next day to compensate. From the beginning where I hated and was afraid of spending time with myself to now, where I find I’m the happiest when I am on my own. I love my own company and spending time on my own. I would rather spend time meditating on my own in silence than spend time with others. That is a big jump for me. I love myself now. I love who I am. It shows in everything I do everyday. So, no. I’ll never ever stop meditating. In fact, I would make the bold statement that meditation is the only practice that I know of that has affected EVERY single area of my life. Finances, check. Relationships, check. Mindset, check. Love, check. Friends, check. Physical body, check. Environment, check. Dreams, check. I mean, there isn’t a single area in my life that hasn’t been affected by meditation. A caveat though. I sit every morning without any expectations. I am not sitting down to meditate because I want to change this particular aspect of my life. For example, if I have conflict in a particular area of my life, I don’t sit down that day expecting my meditation practice to remove the conflict. I am meditating as a whole. My meditation will end up removing that conflict but that isn’t the intention I go into my meditation with. The intention with my meditations are always time with myself. I want to spend time in silence with myself, my true self, my inner self. I love myself and I want to spend more time with myself. That is the only expectation with my meditation practice. Even if I end up doing nothing else with my day on my business, I will ensure I do a meditation practice. The only important practice I have that has to happen every single day (aside from breathing) is meditation. My meditation practice is as important as my daily meals to me. It’s as important as the water I drink everyday. It’s more important than the time I spend with my family or friends. Even if I do nothing else with my day, but I meditate, I consider my day to be complete. A day without meditation is a day wasted in my opinion. If you are starting a practice, make sure you build the importance of consistency into your practice more than anything else. CONSISTENCY matters more to any practice than anything else. Meditate every single day. Do not skip weekends. Keep it simple. Sit for as long as you want to. Don’t force anything. Don’t complicate the matter. Don’t put too much pressure on yourself. Be yourself. Use a technique that appeals to you. You don’t need a guru to meditate. You don’t need a mantra or props or expensive equipment to meditate. Always remember your why with meditation. You are meditating every single day because you are important to yourself. You matter to yourself. Your relationship with yourself is important. The only way anything in your life will change is if you change. Meditation is just the best way to effect that change. Just start. It will change everything. And once that happens, you will be hooked.